Youtube has tools for browser uploading of the videos to the website, but not very good tools are available for mac which can help in uploading the video from the 3rd party software. Here is a tool from Google code developers which can help out with the same. 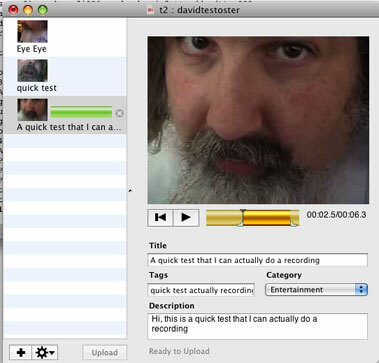 Vidnik is a tool which can help you capture videos through your iSight camera in mac, and then upload those captured videos into Youtube through that tool itself. There is no involvement of the browser in this process. Vidnik is the quickest, simplest, way to make movies using the built – in camera on your Macintosh and upload those movies to your YouTube account. This is the easiest way to use our mac camera, as you don’t need to worry about changing the video format, resolution etc. and everything is already set. You just need to record the video and click Upload to start the upload process directly from Vidnik interface. Check out the Vidnik site at Google code website – Vidnik and download here. Sounds like a good one. Thanks for this tips Chewan! Looks like a nice tool. THanks for sharing. Yes I’ve been using it for quite some time and I gotta admit it makes me want to record more and more useless movies. It’s just so easy that you can’t stop. Highly recomended. I don’t know what you are talking about well I mean I don’t understand?????????? ?